Ashleigh & Burwood have been sharing our passion for fragrance since 1993. Their journey has taught them a lot about fragrance, and they put all their expertise into creating a collection of high-quality fragrances, for you to enjoy. They pride ourselves on their innovation and creativity, and so ensure that every aspect of their inspired and refined products are expertly designed and of uncompromised quality to delight your senses. About The Catalytic Fragrance Lamp. The catalytic burner captures and destroys the molecules that carry odours. The mixing of air and the movement from convection ensures that odours are destroyed as well as airborne microorganisms. Catalytic Fragrance Lamps actually purify the air before perfuming it. Ashleigh & Burwood Fragrance Lamp really does help to cleanse and purify the air. Independent tests conducted for Ashleigh & Burwood give the following results for the destruction of common household microorganisms after testing in laboratory conditions. D. farinae - 99% destroyed after 30 minutes. S. chartarum - 96% destroyed after 30 minutes. Unpleasant Odours - the Ashleigh & Burwood Fragrance Lamp is effective at common household odours such as those from dogs, cats and food spoilage. The Crown covers the hot stone to prevent accidental contact. Various designs are available. The Snuffer-cap covers the catalytic stone. This prevents Fragrance from evaporating when the lamp is not in use. It is also used to cover the hot stone(to turn the Lamp "off"). The Retainer is a small metal clip that holds the stone, collar and wick together. You should never remove this clip. The Stone is a special porous ceramic material coated in platinum and other rare metals. This is where the Lamp does its work. The Collar supports the stone and secures the wick in place. The Wick carries Fragrance from the body to the stone. 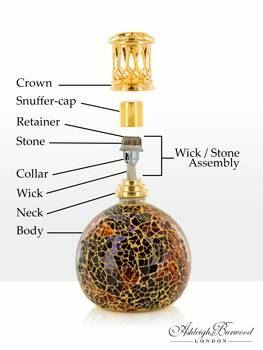 The Assembly is a group name for the wick, collar, stone & retainer. The Neck is a metal crimp attached to the Lamp Body which supports the Assembly. The Body is the main part of the Lamp that holds the Fragrance.